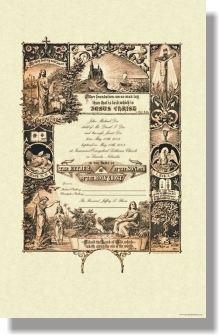 This Baptismal Certificate is full of hand drawn details. It contains several pictorials of Christ and multiple biblical elements. Christ appears in three locations on this certificate, at baptism in the lower left, with His flock in the upper left and on the cross in the upper right. The documents central design contains a symbol of the triune God and is flanked by the words, “In the name of the Father of the Son of the Holy Ghost.” Biblical quotes and references come from John 10:27, John 3:16, Matthew 23:37, John 1:17, 1 Corinthians 3:11 and John 1:17.